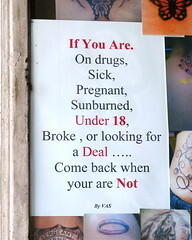 This sign is posted in the window of Sunset Tattoos in Sunset Park, Brooklyn. 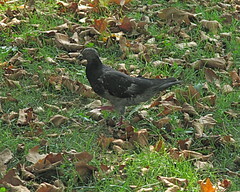 I walked closer and saw that the girl was pointing to a pigeon waddling in the shadows, between the fallen leaves, and yes, she was calling out about an egg. 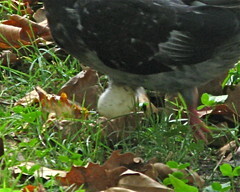 Just above the surface of the ground, a half-laid egg protruded from the bird’s belly. 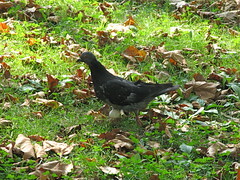 I watched, waiting for the wobbly creature to sit down and complete the act of laying her egg. I hoped to see her perched securely above her sticky little white egg. But she took one rocking step after another without pause. 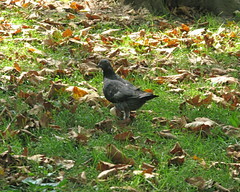 Suddenly, there was a flurry of feathers as the pigeon — the egg still stuck between her legs — lifted her wings, flapped across the street, and disappeared into a small grove of trees on Cadman Plaza. It was late, I was tired, and I couldn’t wait to get back to Brooklyn. The last thing I wanted to do was descend into the hot, stagnant air of the Chambers Street subway station, but down I went. 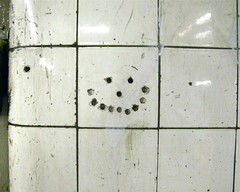 As I walked along the platform, waiting for a train, I saw something completely unexpected: a lopsided little smile, carved into a tile. 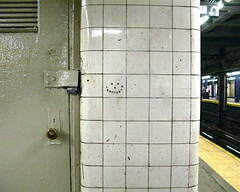 Perhaps the smile was created by a mischievous worker, perhaps by a bored commuter, but either way, it brought a smile to my face and made the night a little bit brighter. At first glance, the building at 110 Amity Street looks as though it might be a grand residence. 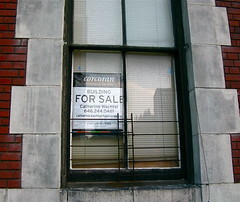 But upon closer inspection, the brick and limestone structure reveals broken, boarded up windows, a slew of paper notices taped to the front door and a dusty-looking “for sale” sign. 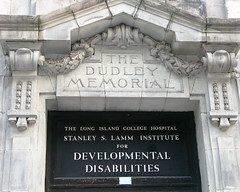 Two names appear above the entrance: The Dudley Memorial, which is carved into the facade, and, painted directly below, The Long Island College Hospital Stanley S. Lamm Institute for Developmental Disabilities. So, what’s the story here? 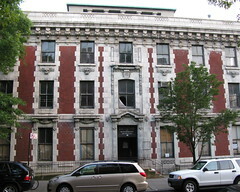 This empty structure at the corner of Amity and Henry Streets was built in 1902 in memory of Dr. William Dudley, one of the founders of nearby Long Island College Hospital, which is now celebrating its 150th anniversary. Designed by Charles Hough, for five years it served as a private pavilion for the hospitals patients, then became a residence for its nurses. 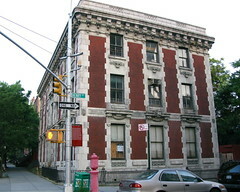 Later, the building housed the Stanley S. Lamm Institute, a facility for the comprehensive care of the developmentally disabled. 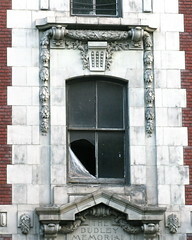 Several years ago the Lamm Institute’s programs were moved to other locations and the stately-looking building has been vacant ever since. Most recently, a developer proposed a plan which included the construction of a rooftop bulkhead and six townhouses in the rear. A combination of community opposition and fallen real estate values has resulted in any plans being delayed indefinitely. Fixed? Did You Say Fixed? Last night this notice was posted in phone booth at the corner of Brooklyn’s Court and Montague Streets. 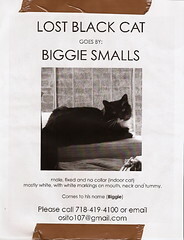 OK, I understand the idea of naming a big, black Brooklyn cat after Biggie Smalls (aka The Notorious B.I.G. )., the famed Brooklyn-born rapper who was murdered in Los Angeles 12 years ago. But “fixing” (neutering) Biggie Smalls, the namesake of a ladies’ man who referred to himself as “Big Poppa,” just seems wrong. No wonder the poor cat has gone missing. 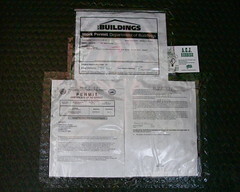 You are currently browsing the Blather From Brooklyn blog archives for August, 2009.